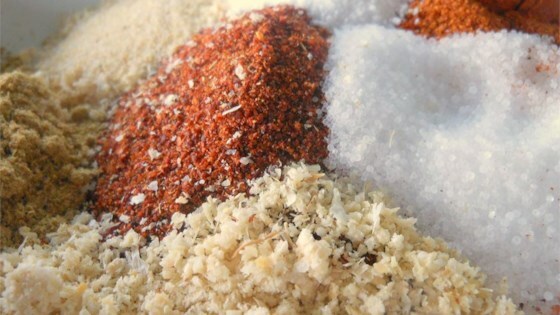 "This is a great recipe to make your own fajita seasoning. No bouillon cubes means this is perfect for vegetarians too! Make up a larger batch and store in an airtight container for future use." Stir cornstarch, chili powder, salt, paprika, sugar, onion powder, garlic powder, cayenne pepper, and cumin together in a small bowl. Turn simple spices into a flavorful fajita seasoning blend. I mixed this with with about 1/4 c. olive oil, 1/4 c, lemon juice, 2 T. soy sauce, and 1 T. vinegar and it was great! This was awesome! I omitted the corn starch because I'm on a low-carb diet and it still was just absolutely phenomenal. I'll be making this one again and again! EXCELLENT!!! Easy, quick to make ahead of time and have on hand, and delicious.